It is tax day and our taxes were faster and easier to figure out than these socks. The book says the pattern is for the ‘trepid’ lace knitter. If the designer had intended to scare off lace knitters, I think she chose the right lace pattern. The stitch pattern is a nice one, all knits, and a short repeat. It just is not easy to follow in the round. I buy pattern books hoping to be able to knit-as-written. That is not the case with this sock pattern, the directions are very limited and misleading. Now that I have figured it out I am going to finish these socks. I checked on ravelry to see if others had notes on the pattern, one mentioned moving the stitches. That knitter knit them same way as I am, each sock separately, one circular needle for each. 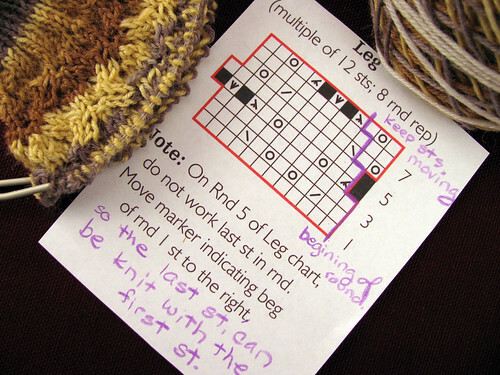 The first photo shows an enlargement of the stitch pattern chart with a purple line to show the first stitch to start each round. If a knitter would start each round with the first stitch of the chart the pattern gets off. Cookie A. could have mentioned that. 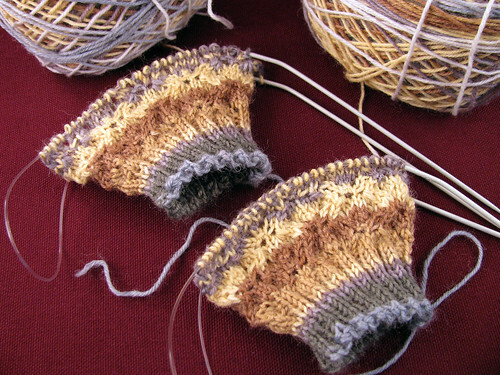 These socks do fit and for the seasoned lace knitter the pattern may be a no-brainer. So not all bad, just more work than I thought I was getting into. This entry was posted on Wednesday, April 15th, 2009 at 3:00 am and is filed under Knitting. Tagged: Knitting. You can feed this entry. You can leave a response, or trackback from your own site. The look really nice in the yarn you selected. And your photography is always so crisp!